No excuses! This is your time. The WHAS11 First Alert StormTeam — rated Kentuckiana’s most accurate — says the weather is top flight! The second leg of the Louisville Triple Crown of Running SM, the Rodes City Run takes the starting gun on Saturday, March 12 at 8:00am. Proceeds from all three Triple Crown runs benefit the WHAS Crusade for Children. You can register now! Click on the logo below. It’s the 2011 Anthem 5K Fitness Classic Saturday, February 26 at 8:00am. It’s the first leg of the Louisville Triple Crown of Running SM. Proceeds benefit the WHAS Crusade for Children. New Year, new you! C’mon give it a try! It’s the 2011 Rodes City Run Saturday, March 12 at 8:00am. It’s the second leg of the Louisville Triple Crown of Running SM. Proceeds benefit the WHAS Crusade for Children. New Year, new you! C’mon give it a try! You’ll love it! It’s the 2011 Papa John’s 10 Miler Saturday, March 26 at 8:00am. It’s the third and final leg of the Louisville Triple Crown of Running SM. Proceeds benefit the WHAS Crusade for Children. New Year, new you! C’mon give it a try! You’ll love it! (Louisville, KY) Registration is now open for the 2011 Louisville Triple Crown of RunningSM (LTCOR) presented by Novo Nordisk! Runners and walkers are viewing a fresh online look this week and discovering new event enhancements when they visit the site. The website, www.louisvilletriplecrown.com, is now open for experienced and novices alike to register for all three or any of the individual events in the popular road race series. Visitors to the website will also see a new Louisville Triple Crown of RunningSM logo that depicts the running spirit of the race series for 2011. The new logo was inspired by the one-of-a-kind ceramic trophy created by Ngoc Phan of Louisville Stoneware. The Louisville Triple Crown of Running team welcomes Novo Nordisk as presenting sponsor for the 7th year running. Novo Nordisk is a world leader in diabetes care, driven by a “Triple Bottom Line” with a commitment to economic success, environmental soundness and social responsibility to employees and customers. “The commitment and support of Novo Nordisk has allowed the Louisville Triple Crown of Running to donate more than $700,000 to the WHAS Crusade for Children in the last seven years,” said Fred Teale, Director of the Rodes City Run 10K. Visitors to the new website will also find that three new sponsors have joined the supporting Triple Crown sponsor family: Chick-fil-A, Sun Tan City and LEO. The Triple Crown race committee is also privileged to continue to work with their family of sponsors, from the local to the national level, including Panera Bread, ValuMarkets, Fast Signs, Fleet Feet, Heine Brothers Coffee, The YMCA of Greater Louisville, Thrifty Truck Rental, Louisville Stoneware, PowerAde, Jewish Hospital Sports Medicine, Rumpke, Louisville Water Company, Waste Management, Bee Line Courier Service, BB&T, 1077SFR, Lite 106.9 and New Country Q103.1. Race officials and runners alike have come to rely on the disposable ChronoTrack B-Tag to time their races with convenience and ease. Because the B-Tag is mounted on the back of the runner’s bib, it is virtually invisible to the participant and requires no special pre- or post-race handling and does not have to be returned. You get a new bib and ChronoTrack tag with each race. The disposable B-Tag insures high accuracy, fast results and simplicity of use. The Louisville Triple Crown of RunningSM has a long-established partnership of generosity with the Crusade for Children having raised more than $700,000 since 1984, including $133,445 in 2010. This year the races had more than 27,000 runners participating in all three events. This resulted in a record attendance for all three races, as well as a record donation to the Crusade. With the exception of the fire departments, this donation placed the three-race series 5th in the top 10 gift-givers for 2010. Also, this total does not reflect the thousands of dollars raised by the Team Crusaders (for CFC), the YMCA, the Metro United Way and other organizations and individuals who raised money for their causes through participation in these events. The WHAS Crusade for Children, Inc., established in 1954 by WHAS-TV, raises money for agencies, schools and hospitals to better the lives of special needs children. In its first 57 years, the Crusade has raised more than $138 million. Thanks to generous contributions of goods and services, the Crusade is able to return 100 percent of all donations to organizations that serve special needs children in all 120 Kentucky counties and more than 50 southern Indiana counties. 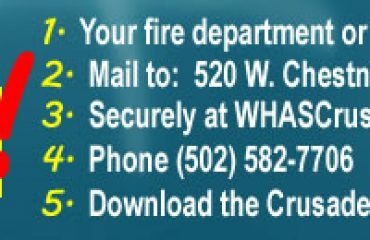 For more information, contact John Blim (502) 582-7521, or visit www.whascrusade.org.